Examples, solutions, videos, worksheets, games and activities to help Algebra II students learn about how to find the nth term of a geometric sequence. 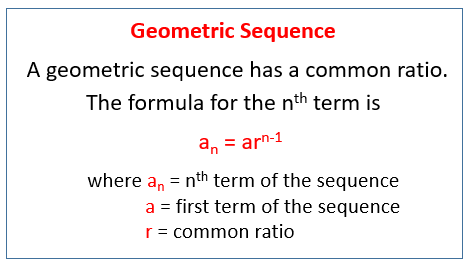 The following figure gives the formula for the nth term of a geometric sequence. Scroll down the page for examples and solutions on how to use the formula. What is the formula for a Geometric Sequence? an = a1rn - 1 where a1 is the first term and r is the common ratio. How to derive the formula of a geometric sequence? How to use the formula to find the nth term of geometric sequence? Geometric Sequences: A Formula for the nth Term. This video shows how derive the formula to find the 'n-th' term of a geometric sequence by considering an example. The formula is then used to find another term of the sequence. This video looks at identifying geometric sequences as well as finding the nth term of a geometric sequence. 1. Given a1 = 5, r = 2, what is the 6th term? 2. Given a1 = 11, r = -3, what is a8? How to find any term of a geometric sequence? This video explains how to find the formula for the nth term of a given geometric sequence given three terms of the sequence. Given the information about the geometric sequence, determine the formula for the nth term.